Triangle is a French Company which has always designed and built unconventional loudspeakers using proprietary drivers and pretty original crossovers. First of all, Triangle midwoofers have always been used to cover a wider than usual frequency range (as we'll remark later). Secondly, high sensitivity has always been on the main goals of Triangle designs, paired with easy driveability with respect to any amplifier. 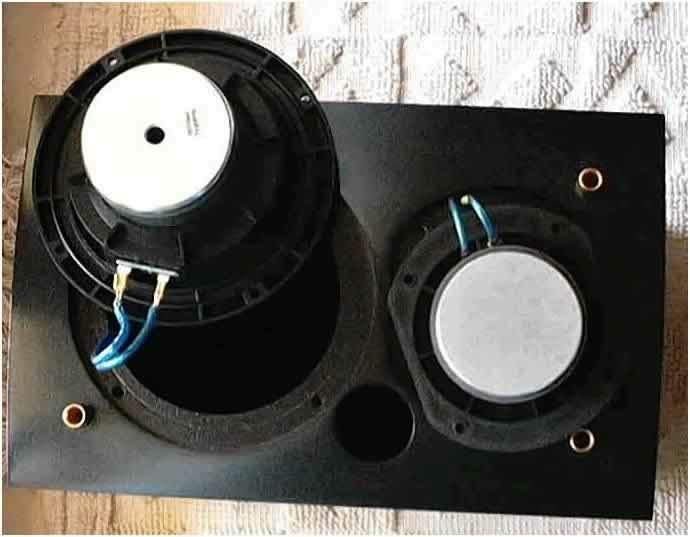 For these reasons Triangle loudspeakers have always been welcomed even by tube nuts, often searching for efficient and easy to drive loudspeakers. The Titus 202 is the latest version of a "classic", the smaller model of the Espace range, a model that has always been highly considered by audiophiles worldwide and highly raved by HiFi experts. The Titus is a small bookshelf loudspeaker aimed for the seasoned audiophile, for someone who knows what to look for in (and expect from) a small loudspeaker. Its price puts the Titus away from the strictly entry-level competitors of the same size but even quite far from hi-end expensive mini-monitors. 500 Euro ($) can be considered a "middle-class" cost for a pair of small freestanding speakers and it can be tought as the real first step into the Triangle-sound world. Consider that for the same price you can easily find entry-level floorstanding loudspeakers. Considering these two aspects I was really curious to put these babies under test. First of all I needed to discover "how much" of the famous Triangle sound could be found in such a small enclosure and, secondly, if 500 Euro was a reasonable amount of money, considering the stiff competition in this price range. The Triangle Titus 202 is a small bookshelf loudspeaker, using two ways in a conventional front-firing bass reflex enclosure, biwireable and with a good level of craftsmanship considering the price tag. The drivers, as said, are made by Triangle: the new tweeter TZ 202 uses a front golden dome (with re-phasing properties) while the T13 PP70C 13 cm (5") midwoofer uses a plied suspension which is commonly seen on big professional woofers. Internal wiring is made by means of multistranded 2.5 mm2 Triangle OFC loudspeakers cable while the drivers are wired to the crossover network with faston connectors (not soldered). The crossover network is quite minimalist (a coil and a cap) and cuts the woofer at 6 kHz, an unusually high frequency even for such a small midwoofer. 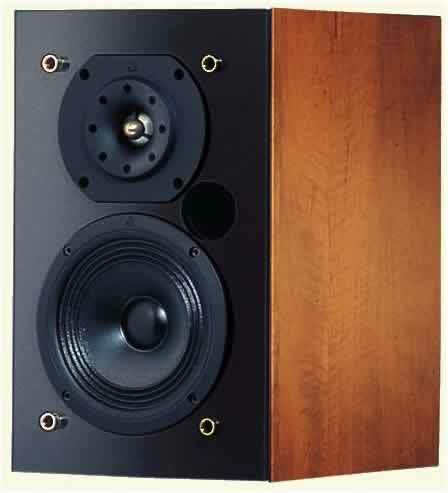 This means the midwoofer reproduces both the bass and the mid range, leaving the high range to the tweeter. On more conventional 2-way designs, the tweeters are forced to reproduce a large part of the mid range too. The crossover network also makes use of an electronic protection that prevents drivers overload. At a first glance, it seems the systems makes use of automatic PTC's. The binding posts are doubled to allow biwiring and since they follow the strict CE safety rules they don't accept banana plugs (just bare wire or forks). The cabinet is quite solid and sturdy and it has been internally filled with sound-absorbing panels. The drivers are firmly kept in place by means of 4 Allen bolts each. The Triangle Titus 202 has been installed on a 60 cm speaker stand, so to have the tweeter at the same level of listeners' ears. Triangle recommends - to get maximum performance - to use its own Boomerang speaker stands. As these weren't available I've tried different models so to be sure to get the best from these speakers. The Triangle Titus 202 have been tested with different amplifiers, even with low powered ones (as low as 10 watts per channel) so to test their claimed easy driveability. French loudspeakers, at least here in Italy, have always been considered unbearably bright. Ask any audiophile with some experience in the field and he will comment "French loudspeakers? Utterly bright!". Perhaps this was true in the past but generalizations always tend to mask ignorance and superficiality. Just to name the first example that comes to my mind, the Equationloudspeakers were everything BUT bright, as I've always found them very neutral and "musical". So, urban audiophile legends aside, let's put these speakers under test. First of all, the tonal balance tends to be on the neutral side, so those who were expecting a "bright" sound should reconsider their position. Secondly, these Titus 202 are - instead - utterly coherent, from the bass to the mid-high range, clearly the midwoofer works well and simulates reasonably the single point ideal source: working till 6 kHz it reproduces the largest part of the audio spectrum and certainly that one where the human hearing is more sensitive. When the midwoofer crosses the tweeter there's no audible "step" though - sometimes - I've been able to distinguish the different timbre of the two membranes. This difference in timbre at the crossover frequency was audible only with certain recordings, much less with others. Generally speaking, a casual listener may find the tonal balance tends to be "open" but - beware! - this has nothing to do with brightness. With a small midwoofer into a tiny enclosure there are physical limits that can't be surpassed so, the lack of weight and body has to be considered perfectly normal. Hence, the speaker doesn't sound "bright" at all...it just lacks the weight of the first octaves (consider the - 3dB point is at 60 Hz). Anyway, despite the hard job the midwoofer has been asked to do (reproduce frequencies from 60 to 6 kHz! ), it sounds absolutely neutral, honest and uncoloured. No boomy bass, just fast, tight and articulated sound. Just try to play some recording with plenty of bass and you will have nothing to complain about. For example, Rosie Vela's "Zazu" (DDD - A&M Records - CD 5016) is a wonderful example of a recording with clean and articulated bass. Considering the guys behind this record (Gary Katz, W. Becker and D. Fagen - Steely Dan!) this sounds perfectly normal, if you happen to know how damn good are Steely Dan recordings. The small Triangle midwoofer can easily "dance" between the various tracks of this record, always reproducing a convincing bass range (both bass and drums). The utterly "clean" recording helps to unveil the Titus precise and vivid performance: solid and tight bass, incredibly fast drums and well defined bass lines. Then you have Rosie's voice, sensual, clean and natural even on the most demanding tracks, when the small midwoofer is forced to "shake" a lot. This normally causes distortion on the mid range because a fast moving cone can't reproduce small nuances of a voice, for example. Not so the Triangle T13 midwoofer! Clearly its low mass coupled to a powerful magnetic field can react equally fast to high power demands (for deep and powerful bass) and low power requirements (for voice and other instruments). Aided by the TZ 202 tweeter the Titus succeeds to reproduce a sound which is both rich in harmonic content and details. Trust me, I've tried some of the "worst" recordings I use to test the bass range, just to discover the midwoofer's limits. For example, one of the best ragamuffin' Italian recordings (Sud Sound System "Comu 'na petra" CNI - GDL 853), a mostly unknown masterpiece both in artistic content and technical performance. Extremely deep bass and powerful percussions are able to force ANY woofer well beyond its physical limit, even at moderate listening levels. Now, despite this hard workout, the Titus 202's have been able not only to survive but even to surprise me with a performance free of annoying compressions and distortions in the bass. OK, there's almost nothing below 60 Hz but I can assure you the rest of the bass range is of very fine quality. Forget the lowest organ pedals (of course) but electric bass and drums are still quite realistic and reasonably powerful. Bass performance aside, the rest of the audio spectrum is reproduced in a very coherent way (after all, a single driver does most of the job!). With detail and precision in spades, the Titus 202 is just a bit dry from time to time, definitely you can't call their performance euphonic, warm or mellow. Indeed, especially when listened in "near field", these loudspeakers can be considered good quality monitors, for their abilty to investigate deeply into any musical program, offering everything to the listener, the good and the bad, recording mistakes included. Yes, these speakers won't be "forgiving" with your records...if something really sounds bad....it will sound worse! :-) BUT!!!! As it always happens with HiFi components with a good level of resolution, good recordings will shine and mediocre ones will unveil details which remained hidden by warm and shut-in components. For example, warm-sounding loudspeakers tend to make everything sound the same. This also means they will be unable to let you follow all the words of a song if this has an intricated musical and rhythmic structure. Take for example "Rosemary plexyglas", one of the best album of the Italian electro-pop group Scisma (EMI - 7243-8-21097-2-3): here voices are mixed with many instruments and sometimes even artificially filtered, processed and equalized. It is hard to follow the singer's cantato when it is buried below dozens of "overdubs" and electronic effects. The Triangle Titus 202 succeeds to let you follow each and any word and to distinctly hear all the added effects. With respect to more acoustic Music (Classical and Jazz) one can't help but notice these loudspeakers respect faithfully any colour of the orchestra or of a jazz trio: all the instruments are reproduced with their own tonal timbre: hence, the horns appear as undoubtedly made out of brass, the violins of wood and metal strings and so on. Once again, that "dry" note appears here and there, depending on the quality of the recording and of the musical genre. Nothing which can be considered unpleasant, especially because matched with rigour and precision. That said, both with Respighi's "Pini di Roma" or Berlioz's "Sinfonia Fantastica" these loudspeakers will be able to take you closer to the real event, thanks to a sense of "being there" only good monitors can give you. Furthermore, there's no need to turn the volume up: this kind of "lively" performance can be achieved even at moderate listening levels. This means the drivers membranes are very light and ready to "move" even with few watts. Summarizing, these Titus 202 show a convincing tonal balance, are coherent, detailed, precise and "open". They never sound warm, mellow or muddy. The sensitivity is quite high (90 dB/w/m) considering the size of the loudspeaker and the fact the midwoofer acts also as a pure midrange. This two facts mean that the drivers' membranes are light and "easy" to move, as already remarked. This translates into fast transient response, quick attacks and decays and good micro and macro dynamics. Actually one of the first adjectives that comes to mind when listening to these speakers is "Fast!". Yes, they react to the "input" from the amplifier very quickly giving birth to a lively and punchy sound, especially with percussive and rhythmic musical programs. So, the drum kit reproduced by the Titus is - if not full bodied - definitely fast and furious: forget that gummy note one sometimes hears from slow and "boomy" drivers. The overall dynamic perfomance is hence very good and if you add the drivers can sound lively even at low listening levels you get a range of "variation" that is wider than usual. In some sense this counterbalances the natural physical limit of the small midwoofer into a small enclosure that can't - obviously - excell at loud listening levels. Yes, they can still sound loud when required, even with musical programs that don't seem adequate for their size. I'm referring to hard rock or heavy metal, for example, where physical impact is strongly needed. With acoustic Music and with a very dynamic demanding instrument such as the piano, these speakers simply shine. You will miss the pathos of the lower keys of the left hand but you will be delighted by the extremely natural sound of the rest of the keyboard, with very quick attacks, harmonically rich decays and that "metallic" note that can be heard from certain performers. As an example, consider Bruce Hornsby's album "The way it is" (BMG - 74321-44421-2): his piano, thanks to the Titus, comes out lively and precise even when playing among several other instruments. One can distinctly hear the decays of the piano notes even when playing together with other keyboards, electric bass, drums and electric guitars. This means the loudspeaker is able to analyze any kind of musical program and deliver it to the listener with ease...even when the recording isn't exactly of the "audiophile" kind! I think you can easily guess how the high resolution sound of these speakers can help building a good virtual soundstage. You can imagine a very good focus and a really stable virtual image. You're right. But this isn't surprising, if you consider the general performance of the speaker. As a rule of thumb, precise and detailed speakers - normally - image quite well. But there's more to it. The Titus 202 can create a very deep soundstage (while I was expecting an "in your face" 3D image) and they literally disappear from the listening room even when in "near field"...now that's a hard task! Of course, you don't get this kind of performance for free! You need to spend at least a couple of afternoons trying to find the perfect location. Most of all, proper "toe in" is the key, here. You just need to try: choose a well recorded disc, with good imaging, and try by yourself. It may be hard to start this way but then you'll begin to learn. And the things you learn directly by experience on YOUR HiFi system are very precious: no magazine (including this one) can help you more. Personal experience is the key. Hence, provided you've found the "sweet spot", the image these small monitors deliver is very realistic and allows you to "look" inside the stage, focus your attention on sections of an orchestra or on players of a jazz band. It can even happen to "view" a 3D soundstage with pop-rock recordings, espcially those ones where the recording engineer has tried to make the sound as natural and realistic as possible. As an example, let me cite "Avalon" by Roxy Music (1982 - EGCD 50), a recording where it is very easy (with these speakers) to detect the position of the different players and singers, a saxophone that stays "behind" a singer and then moves upfront etc. Believe me, these things are not easy to spot with similarly priced loudspeakers. The Italian distributor recommended 100 hours of break in. In my experience, 20 hours were enough to get full performance. Perhaps the kind of break in I use is quite energetic and heavy on the speakers so I can't comment any further. I can only suggest to continue break in till the sound delivered by the speakers reaches a "point of equilibrium" in the sense that it doesn't seem to get better any longer. One thing is for sure: during the first hours of playing (right "out of the box") these Titus 202 sounded thin, esile and even a bit harsh with no bass to speak of. Avoid to judge them while breaking in or you will fail to get a right idea of their real performance. Another "must" to get the best out of these speakers is the use of a proper loudspeaker stand. It is not strictly necessary to use the original Triangle stands, any other good device will work just fine....just avoid placing these speakers on a shelf. If you're planning to place the Titus this way, do yourself a favour: DO NOT buy them, save your money and buy the cheapest pair of bookshelf loudspeakers you can find. If you have decided for a proper installation, avoid to put the Titus too close to the rear wall (and avoid corners as well) though the front-firing reflex port makes this kind of placement less troublesome than with rear-firing reflex ports. Then "toe in" the speakers towards the listening point. I'll let you decide "how much" because it mainly depends on your listeninmg room and on personal taste. Cables. Triangle suggests using their own OFC cables but these weren't available for my tests so I've used others. Triangle cables are nothing else than multistranded OFC 2.5 mm2 wires into a transparent electric blue sleeve, the same which have been used for internal wiring. If you already have other loudspeakers cables, there's no need to buy the Triangle ones, any other good cable will get the job done. If you already have two runs of speaker cables, try biwiring. Amplifiers: up to you to choose. Considering the high sensitivity and the easy load ANY amplifier will be able to perform at its best, even low powered (tube) ones, especially if your room isn't too large. 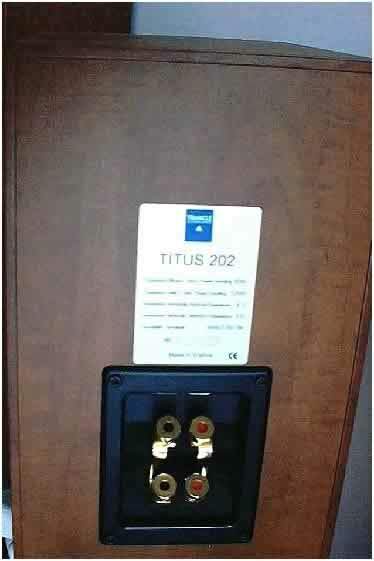 The Triangle Titus 202 offer a five years warranty that covers almost everything EXCEPT owner's misuse. In any case, the electronic protection circuit should prevent damage to the drivers (overload). Finally, these loudspeakers are not meant for Home Theater use so placing them near a TV set can cause colour distortions on the screen. The level of craftsmanship is excellent: drivers are perfectly aligned with the front baffle and I haven't been able to detect a fault, a weak spot, a misaligned panel, nothing at all. Aesthetically they seem to have a good WA factor and certainly they can easily installed into any living room. A negative note comes from the binding posts. Since they don't accept bananas you are forced to use bare wire or forks. This means you need to tighten (by hand) the posts as strong as possible to allow a secure and good electrical contact. Now, these binding posts are so close one to the other that is almost impossible to tighten them by hand. Human beings (and hence even audiophiles) have fingers that need some "space" to operate properly and freely. Is it possible to have conveniently and humanly spaced binding posts? Thanks. Finally, since Triangle suggests using their own cables for the best sonic results, and considering these should be quite inexpensive - being NORMAL multistrand OFC stuff worth a couple of Euro per meter, why haven't they been included in the package? If you have carefully read this listening test you should have learnt this speaker is a very peculiar one: a bit dry and definitely not warm it needs an accurate and extensive listening test in order to be fully understood. A bit dry and slightly "direct" sound with a fast and tight bass: casual listeners may find it not "full" enough to suit their needs. Of course, we're talking of a small loudspeaker with a small 13 cm midwoofer: one can't desire impact, depth and coherence all at the same time for this small amount of money. So, if you're looking for a warm and mellow loudspeaker, with a boomy bass and a "loudness" tonal balance, please look elsewhere. These Triangle Titus 202 clearly confirm the fame the previous Titus models have conquered during the last years: a small loudspeaker, with a friendly attitude towards any listener and any amplifier (being an easy load), a sound with plenty of detail and accuracy and a natural sense of timing that is hard to find into this price range (500 Euro/$ pair). It is, indeed, a small loudspeaker just because of its size, but it can be considered "big" enough to satisfy even the most demanding audiophile on a tight budget or with serious limitation in terms of room size. Of course, there's a price to pay for this but audiophiles with some expertise in the field may find these speakers almost unique for what they can offer in terms of high resolution and overall musicality.